Signed photo of Bobby Kerr the Sunderland footballer. 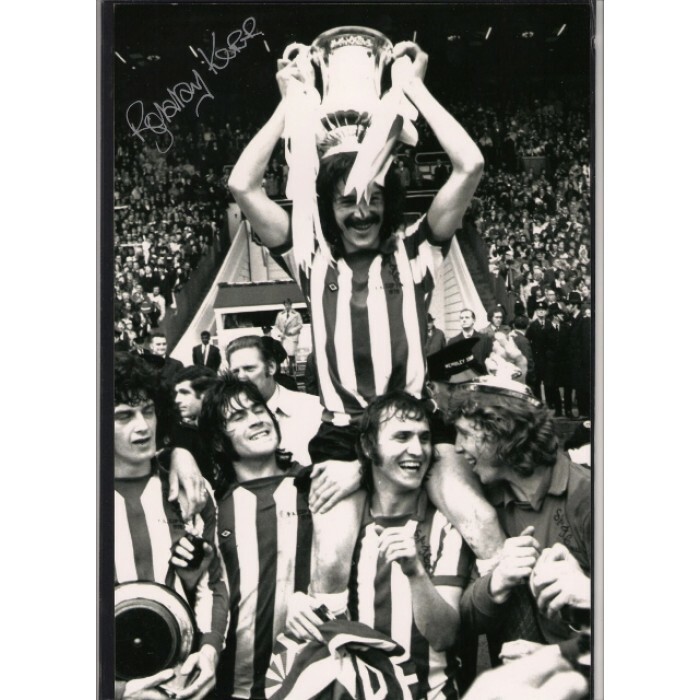 Home » Signed pictures » Signed photo of Bobby Kerr the Sunderland footballer. Bobby Kerr. This is a really fabulous A4 size black and white photo of Bobby Kerr the Sunderland footballer. This photo shows Kerr being ‘chaired’ by his fellow Sunderland players following their shock 1973 FA Cup final win over Leeds United. This is a really terrific item and has been hand signed using a fabulous silver marker pen. Kerr played 368 leagues games for Sunderland between 1966 and 1978 scoring 56 goals. This really is a nice collector piece and very reasonably priced at £7.00.